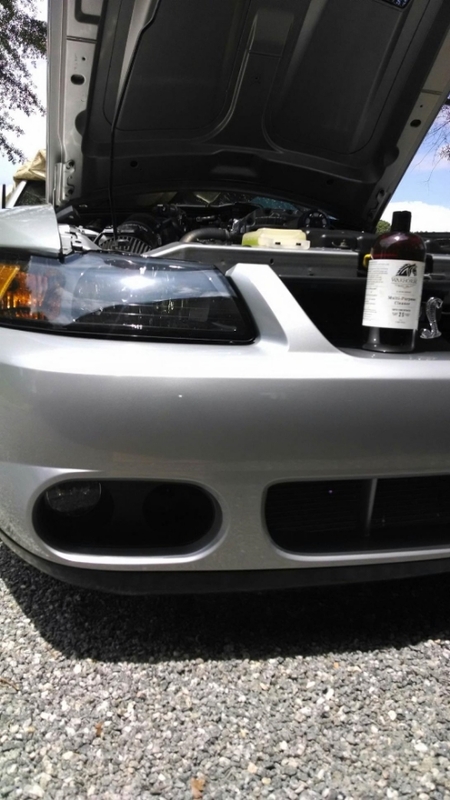 Read about real people using Warhorse on Cars, Trucks, Trailers, Walls, Laundry, Pet Blankets, Facility Floors, Equipment, Carpets, and more - our soaps are working wonders! OMG, that stuff is the BEST! I used it to clean off the front porch and it cleaned everything (it hadn't been cleaned in 5 years). Windows too...and it was nice not to have to worry about it killing the bushes and plants. I’m hooked! Pure Gold All-Purpose Cleaner worked spectacularly on my car. I think she looks better now than when I bought her from the dealership. Works wonders for my barn walls! Warhorse Pure Gold soap works wonders for my reclaimed wood barn walls! I love using the Warhorse Multi-Purpose Cleaner on my trucks. It really makes them shine! I was skeptical at first, thinking that most cleaners are the same—but I was proven wrong. The natural oils make the water bead up on my truck’s paint like it’s been freshly waxed, and my aluminum wheels glisten. This cleaner does all of that while not drying out my skin. Not only is it safe to use anywhere around the farm, it smells great too. We have used the Multi-Purpose Cleaner for many applications. It is great for doing horse laundry. It makes so much sense to use it this way, as there are no worries about it irritating our horses' skin. We also use the Pure Gold and Multi-Purpose to clean all the wood surfaces in the barn. Thank you so much for developing a game-changing product! It is fantastic! Here at Echoview Farm and Fiber Mill, we love Warhorse. We use it when we clean every barn, whether it is for the goats, alpacas or mules. It works great on our animal trailers because it leaves no residue behind. We can just let it dry and put the animals right in. It works like a charm when we clean our equipment, too. Its concentrated form makes it easy to use and easy to store. We wouldn’t be caught without it. It works great. My dad's vinyl siding was covered in fly specks and he wanted something that was safe on the plants because he's pretty cautious about chemicals. I showed him how to dilute the Warhorse and put it on sections of the siding, letting is sit for about 30 minutes. He's 88 and not a big guy, but with a little elbow grease, the specks came off. The 32-ounce bottle cleaned about 450 square feet of surface. He was so happy with it he's gone to his local Ace Hardware and told them they should get Warhorse in their store. We really like the Warhorse soap not only to wash the shop truck, but also as a floor cleaner in the drivers’ shack. It's also used very well as a soap for our facility. The product works great and it’s a plus knowing it is green and good for the environment. I recommend the entire line of Warhorse products. Not only are they environmentally safe, they are really effective! The Hand Soap is one of my favorites. It cleans skin thoroughly and gently, leaves hands soft and has a great light lemon scent. The Multi-Purpose Cleaner was great for washing my horse turnout blankets. Not only did it cut through the caked-on mud, manure and smells; it left the waterproofing intact. I can’t wait to try the whole product line! I let it set for 30 minutes then hit it with a pressure washer. Worked great! I pressure-washed three houses last week and Warhorse is the only cleaner I used. Also this week, I put it in a backpack sprayer and sprayed down my Deere Dozer, let it set for 30 minutes then hit it with a pressure washer. Worked great. About to start on the motor area. It's very greasy/oily. I haven't been keeping up with how much I use, but I still have half a gallon. So it has gone a long way. 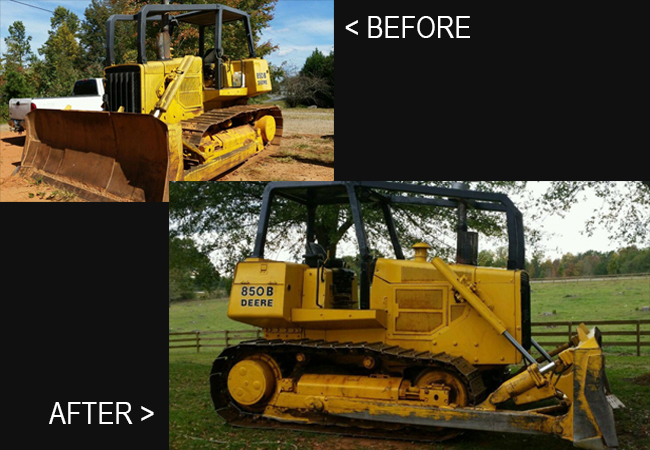 John Holbert, Holbert Landscaping, Tryon, N.C. I mixed 3 ounces in a spray bottle to try it out on the siding, sprayed it on and let it soak about 30 seconds and the spider spots came right off with just a little rubbing. Fantastic. Glad I looked around on the internet and found your product. Next I will try to wash the dirty work clothes that never seem to come clean. Just wanted to tell you how much I love Warhorse! I've used it on everything… all of my wooden furniture, floors, cabinets, and even my dogs. I've used it on my horse tack and saddles, even my car, and put it in my carpet shampooer and laundry deodorizer. With four dogs, I'm always cleaning. The dried-out wood floors at our vet office gets moisturized and cleaned too. I think it's a wonderful all-purpose cleaner. I'm very happy with this product! Thank you for shipping the product promptly. We received it in plenty of time to clean our house prior to company coming for our daughter’s wedding. 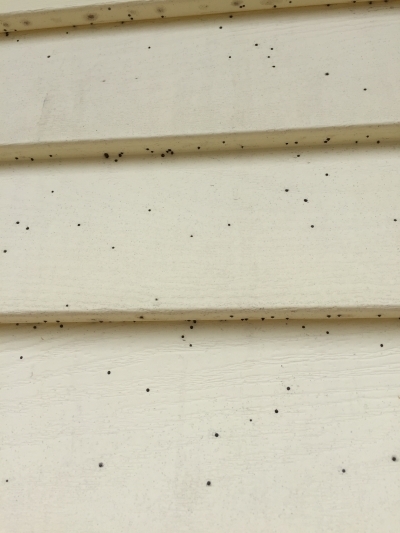 A neighbor is pasturing his cows and calves on our pasture, and the fly specks were everywhere on our steel siding on the house. My wife scrubbed all morning with not much success using common household cleaners. I mixed up a 32-ounce spray bottle with three ounces of Warhorse. I sprayed it on our siding in 10' x 10' areas, let it soak in for a few minutes, then brushed the house with a soft cotton cloth. 95% of the very stubborn fly specks came off after rinsing. The remaining 5% came off with a little more elbow grease. My wife was amazed and our house siding, front concrete patio, doors, window frames and lighting fixtures all look like new. Thank you for a very effective product that was very friendly to the skin, and odorless. This product is great for removing rubber and tar from fender wells and worked great for removing bugs and trash from the radiator. The engine has a lot of electrical parts, and they don't recommend using a lot of water. I put about a half-inch of Warhorse in a spray bottle and filled it with water, shook it up, sprayed everything, let it sit a short period of time and came back with a wet cloth and 95% came right off. After a second application the rest came off. I just wanted to let you know that I really appreciate the suggestion of using the Warhorse Multi-Purpose Cleaner in the washer. It is working great. I have both the kennel side and hospital side using it, and I only wish we had used it sooner. It will save us a lot instead of buying the commercial name brand and the blankets, etc. are coming just as clean and pet hair-free as before. Thanks again. P.S. We will probably go for the 5-gallon when we’ve used what we just purchased. We have been using some of your products for the past several months and are very pleased with the performance for many reasons. We found the soap for vehicles works great as a general cleaner and leaves a nice shine without harsh agents. We use it to pretreat areas with bugs, heavy tar and road oils, and it's amazing how easily it cleans these. And, even after hours of cleaning, my hands feel so soft. We are currently using your product on our horse trailers, race cars, farm trucks and cars. We have also found that your product works well on tires for mud removal. I'm sending you some pictures of the results. At home I use your body and hand soap with the exfoliating agents daily on my hands, feet, legs and elbows. I love how well it softens my skin while cleaning. We were also pleased with the pet shampoo. Our new puppy has the most beautiful brown coat and after his bath with your shampoo, his coat glowed. I also did not notice him scratching or any drying of his skin. So we are happy to find a product for animals that cleans without harmful effects. Thank you so much for allowing us to try all of your products. We are very pleased and will be using them for all our cleaning needs. We have been in business for 40 years and love having a local company to supply us with all of our cleaning products. P.S. Also washed the truck with Warhorse this week. No water marks and the wheels sparkled. The trailer cleaned up beautifully too. I have found Pure Gold All-Purpose cleaner to be the best cleaner around, and quite by accident found out it isn't just for the house, clothes and cars, but it’s also great for my Harley. I have owned and ridden a bike for most of my life, and have used several different cleaners made especially for motorcycles, but have found Warhorse cleans the best by far. Works great to clean the road grime off the bike, and the new grime doesn't stick as bad after cleaning with Warhorse. I think the ingredients in the cleaner make the next wash much easier. I work in historic downtown Savannah, Georgia at the B. Matthews Eatery, in a building and kitchen that date back to the late 1700s. With maybe four ounces of this green cleaner, the crew and I cleaned our entire line — steam tables, coolers, flat-top, fryers, oven, etc. I was shocked at how effortlessly the grease came off of everything, and it works on every surface in our restaurant! After a month or so of using Warhorse, our entire restaurant has switched to this amazing product. From scrubbing floors and cleaning fryers in one of the oldest kitchens in Savannah, to polishing the antique wood of Georgia's oldest bar, Warhorse is the most versatile product used in our family of restaurants and bars now. It seems we find a new use for it every week, and the most amazing part is how gentle and green the product is: no harmful chemicals, and the list of what’s in the soap reads like a recipe. Other restaurants are using it too and, luckily, we get it delivered to Savannah. 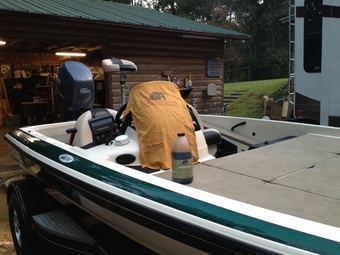 When fishing on a competitive level, it's important to me for both my truck and boat to be clean. No soap cleans both as well as Warhorse! I love that I can wash my boat with Warhorse prior to a tournament, fish all day in dirty water and when it's over there is no nasty water line. Warhorse not only cleans but it keeps dirt and slime from sticking to my white boat. I can honestly say it’s the most exceptional soap I've ever used! Here at Mountain View BBQ & Deli, we use WARHORSE to clean everything. WARHORSE has replaced all of our cleaning products. We use it to clean our floors, tables, countertops, flat-top grill, convection oven, fryers, dishes, and windows. And that’s not all; the beauty of Warhorse is that it’s a fully sustainable product recycled from discarded materials within the restaurant. Old oil that would normally be thrown away and dumped is processed and comes back to us as an all-purpose soap, thus completing a very effective and noteworthy green cycle. We truly believe that Warhorse is an amazing product. I am sending you some pics of the top of our motorhome. Anyone who has a camper or motorhome knows how dirty the top can get, and how hard it is to clean. The top was stained by leaves and sap from the various trees we have camped under. We tried a couple of different cleaners; they worked okay, but they had a high level of acid in them, which can cause streaking on the sides of the camper that is very difficult to remove. When I tried Warhorse on the top, I mixed it 1:1 with water in a spray bottle, and sprayed a small section (about 4 ft.) at a time and let the Warhorse stand on the camper top for about 3 to 5 minutes. Then I used a car wash brush to wash the dirt and stains away. I was very surprised at how Warhorse cleaned, and I had no streaking on the sides from the runoff. Our motor home is over 20 years old and the top is no longer a perfect white color, but the Warhorse did a great job. I used about 16 ounces to clean our 32-foot motorhome. I have been using Warhorse for about a year now and love it! Recently, I worked as a member of Girl Scout Alumni to clean buildings at Camp Golden Valley in Bostic, NC. I donated a 16-ounce bottle for our project. The dining hall—which seats 300— was our big project, with dozens of windows that had not been cleaned in the last ten years. The recommended mixture ratio was followed and when used, immediately removed the grime from the window panes, both inside and out! Screens were removed and scrubbed using a mixture of Warhorse and water. Very little scrubbing was needed with the brushes, and you could see the dirt coming off the screens. There were no worries as we used the cleanser outside due to the environmentally friendly ingredients. One rinse from the hose, and the screens were shiny as new. We moved on to the bathrooms and the industrial kitchen. The minty smell was easy on our sinuses as we cleaned. It was so nice to smell mint instead of the traditional smells of chlorine and ammonia! Camp buildings were sparkling and ready for summer use by the time we were finished. Oh.....several of the volunteers were so impressed with Warhorse, that I took orders and filled them at our next event. Thanks Warhorse Solutions!